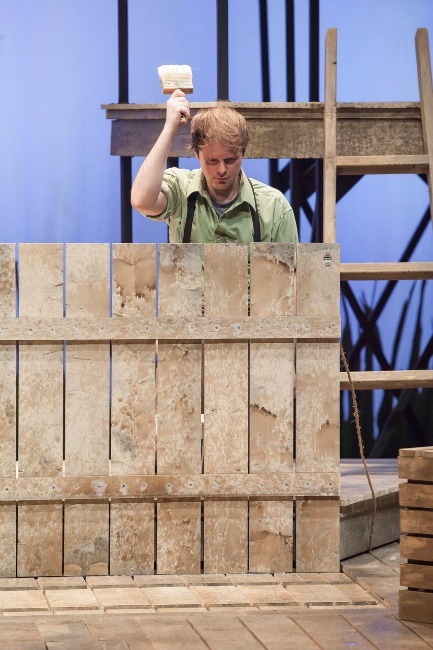 Tom Sawyer premiered this weekend at Cincy Shakes and will run through December 9th. The show was downright delightful and would make an excellent holiday outing for families or even as a date night. 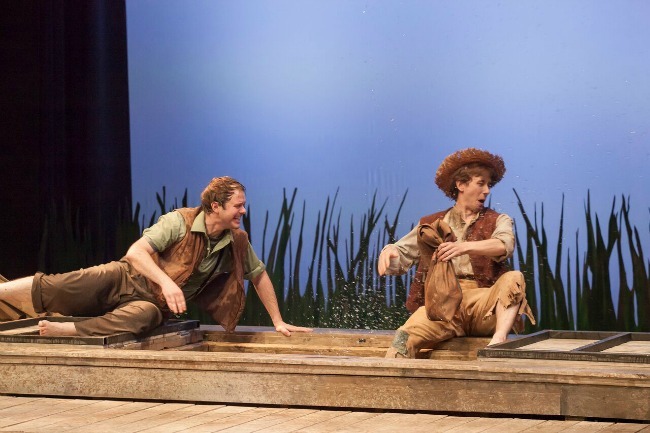 Tom and Huck’s antics and Becky Thatcher’s sass had me and Sam in stitches. And the intense scary scenes had us on the edge of our seats. This show has it all…adventure, love, murder, mayhem and hilarity. The cast was outstanding, I could not keep up with the costume and character changes. I could not believe that eight actors were able to successfully pull off playing countless different roles throughout the show. Sam was pretty impressed too. And the use of lighting, sound and stage features was incredible as well. At first glance the set seems pretty simplistic, but Cincy Shakes transformed the space into many different settings with a simple flip of a panel. I predict that tickets will go pretty quickly to this show, so I recommend getting yours very soon! 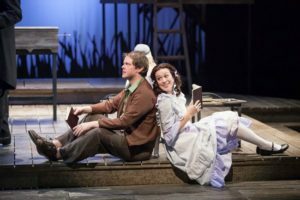 Cincinnati Shakespeare Company Brings the Entire Family Closer to the Adventure with Tom Sawyer this Holiday Season! Audiences will adventure through Mark Twain’s American classic, beloved by children and adults, alongside iconic heroes Tom and Huck. 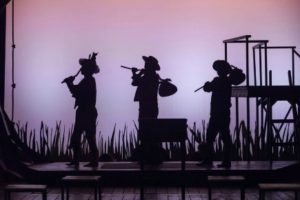 The Adventures of Tom Sawyer, adapted by Laura Eason from the novel by Mark Twain, will open at The Otto M. Budig Theater just in time for the start of the holiday season! This high-spirited adventure tale will be directed by Associate Artistic Director Sara Clark and features Resident Ensemble members Cary Davenport, Caitlin McWethy, Kyle Brumley, Miranda McGee, and Justin McCombs. Young Tom Sawyer (Cary Davenport) is a boy who lives a simple life but longs for adventure and glory and to catch the eye of his pretty classmate Becky (Caitlin McWethy). Tom’s world of boyhood fantasy is turned topsy-turvy when he and his best friend Huckleberry Finn (Kyle Brumley) witness a crime and get swept up into a real-life adventure as they learn important lessons about bravery, honesty, and what it is to grow up. 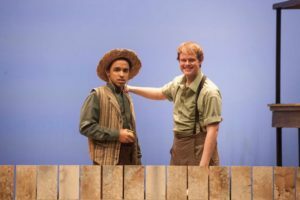 The Adventures of Tom Sawyer runs November 17-December 9, with performances on Thursdays, Fridays, and Saturdays at 7:30 PM and Sundays at 2:00 PM, as well as Saturdays November 25 and December 9 at 2:00 PM. There will be no performance on Thursday, November 23. The Adventures of Tom Sawyer is recommended for children ages 8+ but the whole family can still join us- on Sundays Nov. 26 or Dec. 3, bring your younger kids (4+) for Artist-led child care DURING the performance! The “Playdate” program is only $15 and free for Subscribers. The option to add this program will be available as you are buying tickets for either of these show dates. Activities will range from Shakespeare Storytime to theatre games and crafts. Share the great benefits of CSC’s programming with your children: Playdate will style activities to correspond with each production, so even your youngest can join in the discussion on the ride home! The theater is now located at The Otto M. Budig Theater at 1195 Elm Street in OTR, adjacent to Washington Park. To purchase tickets or for more information, call the CSC Box Office at 513.381.BARD (2273) ext. 1, or go online at www.cincyshakes.com. Valet Parking is now available for every performance! Make reservations for $10 in advance when purchasing tickets.